Have you considered how you might use content to attract customers? That's what Mike Klassen, The Magalog Guy, and I discussed in a 34 minute podcast that he describes in The Power of Content to Attract More People to Your Business. Some people might think it's simply the sales letter on your website. Others may only look at it as reports people can download. 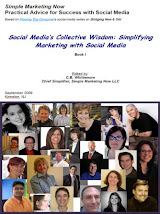 In your mind, what does "content" cover? Why is content so important today? If I have a product or service and a good message on my landing page, is there any need to spend time creating extra content that people may not read? From what I've been hearing, "fresh" content is now being more heavily weighted by the search engines. If that's true, what does that mean for my business in terms of how I'll show up in search results? Is a blog the best starting point for content, or should I consider something else? And if so, is being hosted on Blogger.com or Wordpress.com good enough, or should it be on my own site? How much content is enough? Some people seem to put out content on a daily basis, others weekly. Does it matter? Let's talk about the flow of content. Maybe it starts on a blog, but where should I spread it to from there? Where might people get the most bang for their buck? Is there some way I can measure what the content is doing for me? 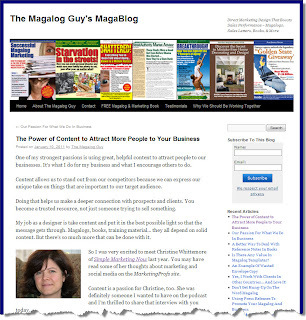 Click on Mike Klassen's post The Power of Content to Attract More People to Your Business and listen to the interview there. Visit The Magalog Guy's podcast page [and explore his other podcasts]. Access The Magalog Guy Podcast on iTunes. 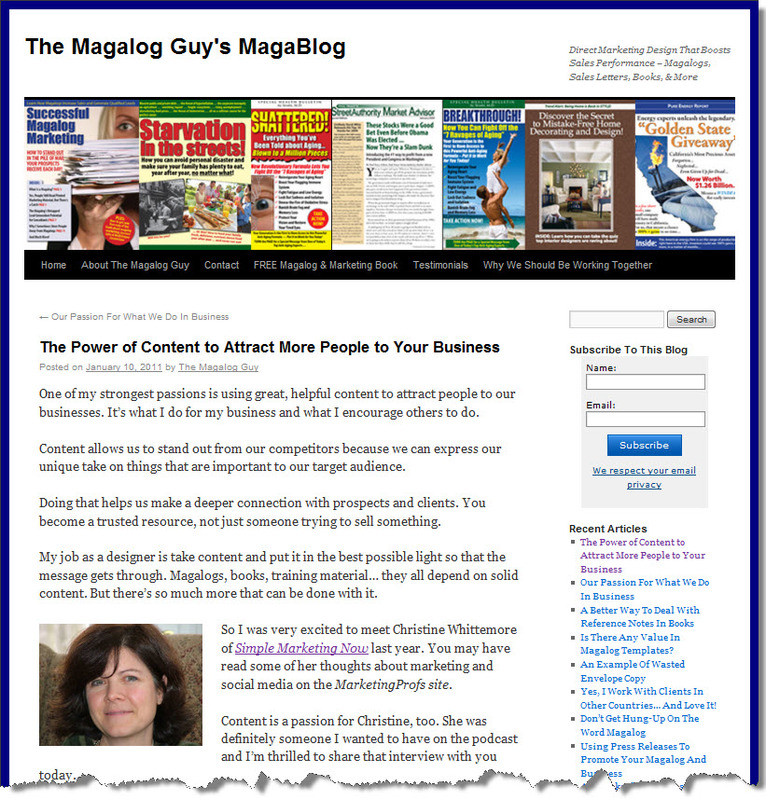 Mike, thanks so much for the opportunity to discuss how to attract customers with content. I had a blast. Junta42 Best Content Marketing Blogs Updated!